Nitrous oxide (N2O) is a major greenhouse gas and cultivated soils are the most important anthropogenic source. N2O production and consumption are known to occur at depths below the A or Ap horizon, but their magnitude in situ is largely unknown. At a site in SW Michigan, USA, we measured N2O concentrations at different soil depths and used diffusivity models to examine the importance of depth-specific production and consumption. We also tested the influence of crop and management practices on subsurface N2O production in (1) till versus no-till, (2) a nitrogen fertilizer gradient, and (3) perennial crops including successional vegetation. N2O concentrations below 20 cm exceeded atmospheric concentrations by up to 900 times, and profile concentrations increased markedly with depth except immediately after fertilization when production was intense in the surface horizon, and in winter, when surface emissions were blocked by ice. Diffusivity analysis showed that N2O production at depth was especially important in annual crops, accounting for over 50% of total N2O production when crops were fertilized at recommended rates. At nitrogen fertilizer rates exceeding crop need, subsurface N2O production contributed 25–35% of total surface emissions. Dry conditions deepened the maximum depth of N2O production. Tillage did not. In systems with perennial vegetation, subsurface N2O production contributed less than 20% to total surface emissions. Results suggest that the fraction of total N2O produced in subsurface horizons can be substantial in annual crops, is low under perennial vegetation, appears to be largely controlled by subsurface nitrogen and moisture, and is insensitive to tillage. IS and GPR conceived and designed the study; IS performed the research; and IS and GPR wrote the paper. The online version of this article ( https://doi.org/10.1007/s10021-019-00363-z) contains supplementary material, which is available to authorized users. N2O is generally assumed to be emitted only from the top 25 cm of cultivated soils. In annual crops up to 50% of surface emissions were generated below topsoil horizons. Dry conditions deepen the proportion of total flux from depth; tillage has little effect. Nitrous oxide (N2O) is a major greenhouse gas also responsible for stratospheric ozone depletion. Cultivated soils produce more than 50% of all anthropogenic N2O emissions (Smith and others 2007; Robertson 2014), and although emissions of N2O from such soils have been studied extensively for decades, most attention has been directed toward total surface emissions and emissions that are produced in the top few centimeters of the soil profile (Robertson and Groffman 2015). However, N2O can also be produced and consumed at depths deeper than the A or Ap horizons (Clough and others 2006), though little is known about the quantitative importance of such production. Evidence for significant subsurface N2O production is largely inferential, consisting mainly of sharp increases in N2O concentrations with depth. For example, Van Groenigen and others (2005a) and Goldberg and Gebauer (2009) observed N2O concentrations 20–30 times those of the free atmosphere at subsurface sampling points of 50–90 cm. N2O dissolved in groundwater can also substantially exceed atmospheric equilibrium concentrations (McGill and others 2018). In most soils the only logical explanation for such steep concentration gradients is subsurface N2O production. To date, however, rates of subsurface N2O production have not been measured in situ. Other evidence for significant subsurface N2O production includes denitrification enzyme activity (DEA; for example, Castle and others 1998; Kamewada 2007) and isotopic concentrations of N2O in laboratory soil columns (Clough and others 1998) and in situ (Van Groenigen and others 2005b). DEA usually declines rapidly with soil depth. Kamewada (2007), for example, observed an abrupt drop in DEA in samples from an Andisol soil at depths between 0.5 and 1 m, below which DEA was low and constant to 5 m, leading to a conclusion that subsurface denitrification was negligible. Others have also observed substantial decreases in volumetric (per m3) or gravimetric (per kg) denitrification rates with depth in different environments (Hashimoto and Niimi 2001; Murray and others 2004; Goldberg and others 2008). Nevertheless, even 20-fold lower rates by mass or volume could still represent significant N2O production at the ecosystem scale when expressed on an areal (per m2) basis because of the substantial volume of subsurface soil relative to surface soils. Subsurface N2O production could be especially important during dry periods when surface horizons lack sufficient moisture to produce much N2O (Goldberg and Gebauer 2009) and during cold periods when surface soils are frozen. Van Groenigen and others (2005b) attributed high wintertime N2O fluxes in a cropped sandy soil in the Netherlands to subsurface denitrification while surface soils were frozen to several centimeters. The potential importance of subsurface N2O production at other times of the year has been noted by those working in a variety of systems (Kammann and others 2001; Addy and others 2002; Well and Myrold 2002; Clough and others 2006). N2O produced at depth can either be consumed by denitrifiers in situ or diffuse to other locations in the profile where, if not consumed, it will eventually be lost to the atmosphere or groundwater. Once in groundwater, dissolved N2O can re-emerge in springs (Beaulieu and others 2008) and in pumped irrigation water (McGill and others 2018) to be degassed to the atmosphere. 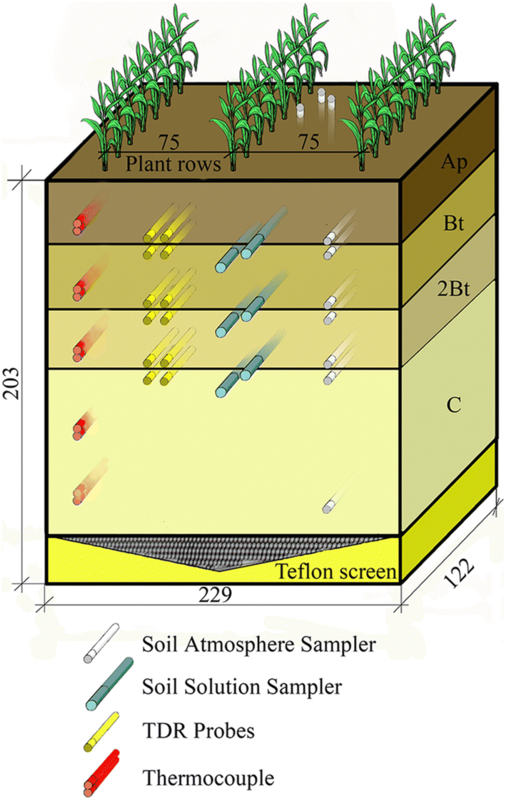 Diffusion in any given soil layer is controlled by the N2O concentration gradient, soil porosity, water-filled pore space (WFPS), and temperature (Shcherbak and Robertson 2014). Consumption of N2O produced deeper in the profile is more likely than consumption of N2O produced at shallower depths due to a longer residence time for deeper N2O, due in turn to a longer diffusion path (Castle and others 1998). Based on increasing δ15N values and decreasing N2O concentrations, Goldberg and others (2008) concluded that N2O was likely consumed during upward diffusion, although precise estimates of consumption were obscured by high diffusion rates. Clough and others (1998) and Van Groenigen and others (2005a) combined isotopic signatures of N2O with soil profile concentrations and measurements of atmospheric N2O emissions to also document N2O consumption during its upward movement in the profile. In a sieved and repacked soil column, Clough and others (2006) used 15N–N2O to show that consumption could deplete one-third of the N2O produced, although repacked columns may not reliably approximate subsurface processes in situ due to the effects of sieving on microsite oxygen availability (Sexstone and others 1985) and subsequently on the rate of denitrification (Robertson 2000) and the molar ratio of N2:N2O (Cavigelli and Robertson 2001). Subsurface denitrification is likely co-limited by NO3−, carbon, and WFPS. All three limitations typically change with depth. First, while soil NO3− concentrations in the range 1–10 mg NO3−–N kg soil−1 have been reported to limit denitrification (Barton and others 1999), in cropped systems NO3− leached from surface soils typically creates concentrations well above this range for much of the year (for example, Thorburn and others 2003; Syswerda and others 2012; Nisi and others 2013). Second, although soil organic carbon decreases rapidly with depth (for example, Syswerda and others 2011), dissolved organic carbon (DOC) leaches readily (Kindler and others 2011) and is sufficiently bioavailable to stimulate denitrification in both surface (for example, Myrold and Tiedje 1985; Myrold 1988; Weier and others 1993) and subsurface soils (for example, Weier and others 1993; McCarty and Bremner 1992; Murray and others 2004). Third, high WFPS at depth favors denitrification because high WFPS restricts the movement of oxygen, which at the same time is being consumed by heterotrophs stimulated by DOC inputs to aggregates and soil pores (Kravchenko and others 2017). There is thus reason to expect subsurface soil horizons to be a significant source of N2O produced in situ, and if this N2O moves to surface horizons, to be a significant source of surface-emitted N2O. Here we examine subsurface N2O production in an intensively managed cropping system in the US Midwest (1) to identify patterns of N2O concentrations with soil depth and (2) to evaluate the contribution of N2O produced at different profile depths to surface emissions using N2O profile concentrations and diffusivity measurements. We examined in existing replicated experiments subsurface N2O production under till versus no-till corn (Zea mays L.), under no-till corn as affected by irrigation and N fertilizer rate, and under perennial vegetation that included alfalfa (Medicago sativa L.), hybrid poplar (Populus sp. ), and two unmanaged successional communities. We performed experiments at the Kellogg Biological Station (KBS) Long-Term Ecological Research (LTER) site, located in southwest Michigan in the northeast portion of the US Corn Belt (42°24′N, 85°24′W, average elevation 288 m). Annual rainfall at KBS averages 1027 mm year−1 with an average snowfall of about 1.4 m. Mean annual temperature is 9.9°C ranging from a monthly mean of − 4.2°C in January to 22.8°C in July (Robertson and Hamilton 2015). Soils are co-mingled Kalamazoo (fine-loamy, mixed, semi-active, mesic Typic Hapludalfs) and Oshtemo (coarse-loamy, mixed, active, mesic Typic Hapludalfs) loams (Table 1, from Crum and Collins 1995) formed on glacial outwash with intermixed loess (Luehmann and others 2016). We used two measurement systems to address our objectives: (1) in situ monolith lysimeters, established 20 years earlier, to test the effects of tillage on subsurface N2O production and (2) soil profile gas probes to test the effects of irrigation, N fertilizer input, and crop type on subsurface N2O production. Monolith lysimeters provide a known soil volume and the ability to frequently measure associated biophysical variables at specific soil depths. Soil profile gas probes, on the other hand, can be readily installed in different locations without disturbing normal field operations and thus can be deployed extensively. We sampled monolith lysimeters for 19 months beginning in May 2010. We sampled soil profile gas probes in different treatments of the LTER Resource Gradient Experiment and the LTER Main Cropping System Experiment (MCSE) (both described in Robertson and Hamilton 2015) for seven months beginning in May 2011. Field plots for monolith lysimeters were established in 1986 to study tillage and N supply effects on plant–soil interactions. Sixteen 27 × 40 m plots were randomly assigned within blocks to N-fertilized versus non-N-fertilized and till versus no-till treatments in a randomized complete block design with 4 replicate blocks per treatment (Aiken 1992). Monolith lysimeters were installed in two unfertilized no-till plots (NT6 and NT9) and two unfertilized till plots (CT2 and CT13). The monolith lysimeters (Figure 1) were installed in spring 1990 by excavating the perimeter of 8 m3 (to fit 2.29 × 1.22 × 2.03 m pedons) located at least 5 m from the edges of the respective plots. During excavation, a stainless steel chamber was lowered over the undisturbed portion of the pedon following the procedure of Brown and others (1974). The intact pedon was temporarily capped, removed by crane as an assemblage, and inverted in order to weld a 0.43-m-deep extension onto its bottom; the extension was then filled with C horizon sand followed by a layer of pea gravel separated from the sand by a Teflon screen. The base of the extension was sloped to the center drain. The lysimeter assembly was then returned to its original upright position, and the surrounding soil was replaced by profile layer and allowed to settle. Soil profile mappings of the excavation provide a detailed description of soil horizon depths (Table 2). Schematic diagram of monolith lysimeter with instrumentation ports for nondestructive sampling of soil atmosphere, soil solution, soil moisture, and soil temperature. All units are in cm. CT refers to the till treatment, and NT refers to no-till. From 1985 to 2002 all plots were in a corn–soybean rotation and from 2004 to 2009 in a wheat–corn–soybean rotation. For this study in 2010 and 2011 all plots were planted to corn [Dekalb DKC 52-59 at a standard 0.75-m row spacing and seeding rate (69,000 seeds ha−1)], and N fertilizer (ammonium nitrate) was broadcast at the recommended rate of 145 kg N ha−1 (Warncke and others 2004), with 34 kg applied at planting and the remainder 1 month later. Corn was planted in 3 rows across the top of each lysimeter with 15 cm between plants in the same row. Tillage within the two tilled lysimeters was performed by hand-spading to mimic the chisel plowing (to 25 cm) used elsewhere. For each lysimeter, an outlet at depth provided drainage, and an access tunnel provided underground access to one side. Instruments to measure solute, gas, moisture, and temperature (Figure 2) within the entire volume of soil were installed 2 cm above and below the borders of major horizons directly below the center row of corn (Figure 1). N2O flux from the surface of the soil profile was also measured (described below). 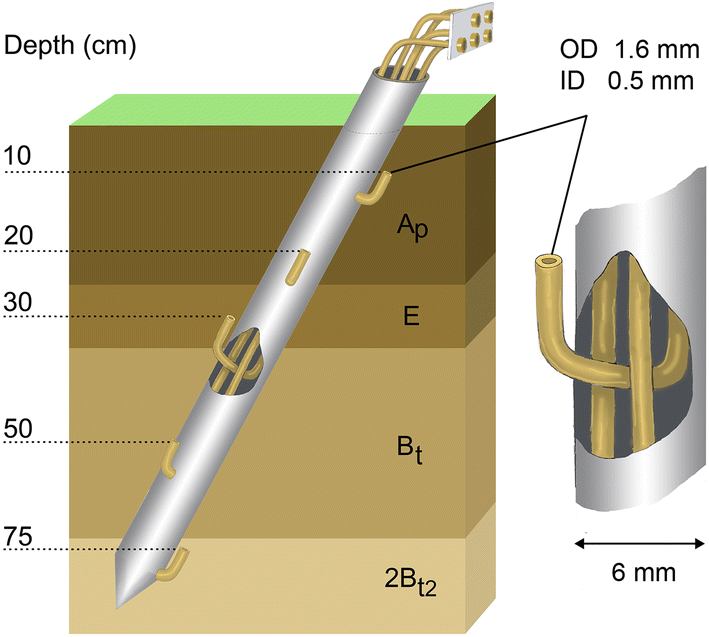 Schematic representation (top view, not to scale) of nondestructive probes in a soil profile layer in a monolith lysimeter. Soil temperature in the profile was measured with type T (copper–nickel alloy junction) thermocouples (Scervini 2009) every 15 min at six soil depths (7, 20, 50, 75, 100, and 125 cm) with a 1°C limit of error. 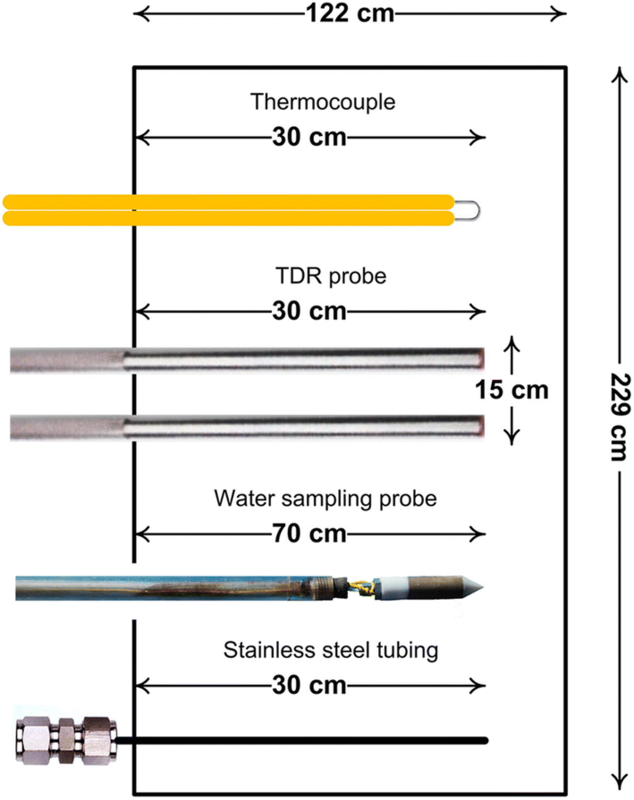 Soil moisture was measured with time-domain reflectometry (TDR; Cerny 2009) every 15 min at five depths (20, 25, 50, 55, and 75 cm) with paired 0.5 × 30 cm stainless steel rods as TDR wave guides. Each of the lysimeters was connected to a multiplexer that connected five pairs of rods. Two TDR units (Campbell Scientific TDR100) received measurements from four monolith lysimeters, with the closest lysimeters paired (CT2 paired with NT6, and NT9 paired with CT13) to keep separation within the 70-m limit of the instrument and avoid signal degradation. Data for temperature and moisture were stored in a Campbell Scientific data logger CR10X. Soil atmosphere was sampled using a system of stainless steel tubing. Tubes were installed at 10 different depths in the profile: 3, 7, 15, 20, 25, 50, 55, 75, 80, and 140 cm. All tubes were about 1.6 mm (o.d. ), 0.5 mm (i.d.). Tubes for sampling at 3, 7, and 15 cm depths were installed vertically from the top of the profile. Other tubes were installed horizontally with ends 30 cm from the lysimeter wall to avoid edge effects. Tubes were capped with septa inside the access tunnel, creating a system with a dead volume of no more than 2 mL. Nitrous oxide fluxes were measured at the top of the profile using the static chamber method (Holland and others 1999). A closed-cover flux chamber was placed on the soil surface to trap soil gases otherwise emitted to the atmosphere. Chambers stayed open except for the period of measurement (~ 2 h). During the measurement period samples from chamber headspace were taken every 30 min by inserting a syringe into the cover’s rubber septa and drawing 10 mL, which was placed in a 3.9-mL glass vial (Exetainer LABCO) pre-flushed with headspace gas; overpressure avoided contamination during transport and storage (Kahmark and others 2018). Gas measurements of soil atmosphere concentrations and surface fluxes were taken at the same locations twice per week with some additional measurements after major rain events and management operations. A 10-mL syringe and non-coring needle were used for sampling. For each sample, an initial 10-mL volume was taken to flush the system’s dead space and a second 10-mL volume was used to flush the 3.9-mL vial. A third 10-mL volume was added to the vial to create an overpressure. Gas samples were analyzed for N2O using a gas chromatograph (Agilent 7890A) equipped with an autosampler (Gerstel MPS 2 XL). N2O was separated with one of two Restek PP-Q 80/100 packed columns (length 3 m, ID 2 mm, OD 3.175 mm) and detected using a 63Ni electron capture detector at 350°C. Carrier gas was 90% Ar and 10% CH4 (Ultra High Purity Grade 5.0 with a Restek 21997 moisture trap and Restek 20601 oxygen scrubber) at a 10 ± 0.5 mL/min flow rate. Oven temperature was 78°C during the first 5.5 min of the run, and then the column was back-flushed and baked for 0.5 min (terminal temperature 105°C; increase rate 55°C/min) prior to the next sample. We used soil profile gas probes that are fully described in Shcherbak and Robertson (2014). Briefly, each probe consisted of a 90-cm-long × 6-mm-diameter (o.d.) master tube that contained five stainless steel sampling tubes each protruding at different distances along the master tube 3 cm from its outer wall. We installed the probes at a 60° angle to minimize the potential for preferential water flow along the master tube. Sampling depths were 10, 20, 30, 50, and 75 cm (Figure 3). Gas sampling protocols were identical to those for gas probes in the monolith lysimeters. Soil profile gas probe (6 mm diameter) installed at 60° angle with sampling tube depths at 10, 20, 30, 50, and 75 cm (modified from Shcherbak and Robertson 2014). The soil profile probes were placed in the LTER Resource Gradient Experiment and the LTER Main Cropping System Experiment (MCSE). The Resource Gradient Experiment is a randomized complete block design experiment with irrigation × fertilizer treatments in 4 replicate blocks. Rainfed and irrigated treatments in each replicate include 9 fertilizer levels planted to a corn–soybean–winter wheat rotation (corn during the present study). Plots have been no-till since at least establishment in 2005, and corn management was similar to that in the monolith lysimeter no-till treatment. Irrigation (146 mm) was applied based on standard irrigation scheduling software and was sufficient to meet crop needs. For this study we selected a subset of plots with 6 fertilizer input levels (0, 67, 101, 134, 168, and 246 kg N ha−1) in unreplicated rainfed and irrigated blocks equipped with automatic chambers that monitored gas fluxes from the soil surface. The 12 soil profile gas probes were each sampled 36 times during the season, with more intensive sampling after fertilization and with sampling frequency decreasing as the season progressed. Automatic chambers measured soil surface N2O fluxes every 6 h via a gas chromatograph installed in the field (Scheer and others 2012). Both rainfed and irrigated plots had replicated continuous measurements of surface temperature and moisture. In the MCSE, soil profile gas probes were installed in four replicates of each of two perennial cropping systems and in two reference communities with successional vegetation. The two perennial cropping systems were alfalfa (Medicago sativa L., herbaceous) and hybrid poplar (Populus sp., woody). The two reference communities were a minimally managed early successional community and a mown grassland (never tilled) community. Robertson and Hamilton (2015) provide more cropping system details. Each of the replicates had a soil profile gas probe installed as described above sampled weekly at mid-growing season and then biweekly later in the season. We measured N2O surface fluxes biweekly by the static chamber method together with surface horizon temperature and moisture. We calculated average temporal autocorrelations and their standard errors for surface N2O fluxes and for N2O concentrations at all depths to estimate temporal continuity. Autocorrelation close to a value of one indicates high temporal continuity such that most measurements are very similar to the preceding measurement. Autocorrelation close to or below 0 indicates no continuity between measurements over time. We obtained average correlations and standard errors among N2O fluxes and N2O concentrations. Different rates of N input in the Resource Gradient Experiment were used in lieu of replicates for the autocorrelation calculations. We searched for an extinction parameter t minimizing sum of squared residuals for the e−td correlation model, where d is the distance between the depths of measurements. Daily N2O flux in a given soil layer was calculated as N2O diffusivity in that layer (as described below) multiplied by the N2O concentration gradient (Fick’s first law), that is, concentration increase per cm of increasing depth. We assumed for this calculation that daily concentration profiles are static. Total N2O production (or consumption, if negative) plus a concentration change for a given layer is equal to N2O flux into the layer less N2O flux out of the layer. Previous laboratory experiments on soils from the MCSE and Resource Gradient Experiment sites show that consumption of N2O during its diffusion toward the soil surface is negligible (Figure 3 in Shcherbak and Robertson 2014). Diffusivity of N2O was calculated based on modeled soil water content and the best fit diffusivity model (Millington 1959) most appropriate for the experimental site (Shcherbak and Robertson 2014). Water content in each stratum was estimated using the System Approach to Land Use Sustainability (SALUS) model (Basso and others 2006) and validated with water content measured at 0–25 cm. The SALUS model required soil conditions (soil texture, bulk density, carbon and N content, initial moisture), daily weather (rain, temperature, solar radiation), and agronomic management data in order to simulate daily water balance. Seasonal N2O production for each layer and N2O surface flux was calculated by linear interpolation of respective daily values across the season. Comparisons between total emissions at different depths were made with the t test. All data reported here are openly available on Dryad (Shcherbak and Robertson 2019). 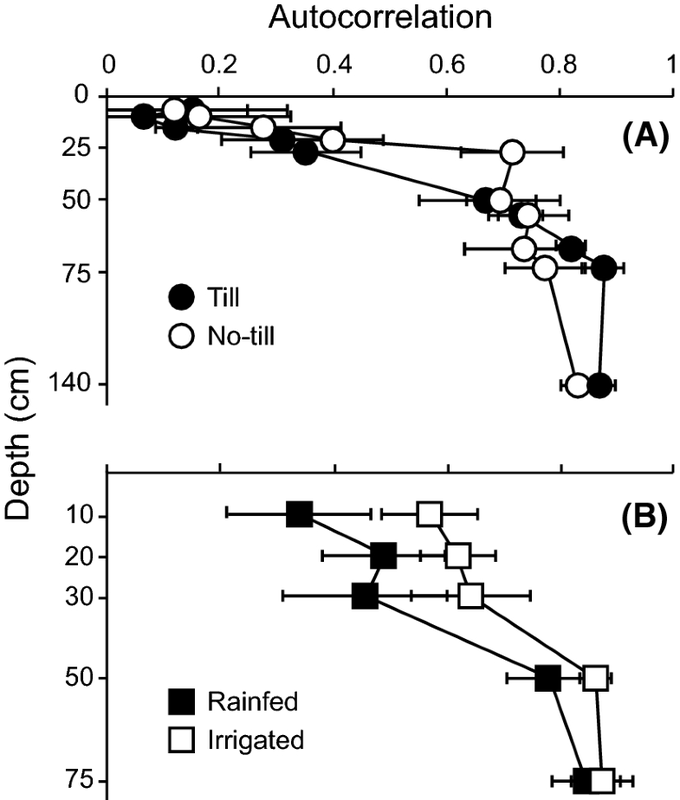 Mean seasonal N2O concentrations increased sharply with depth in the till and especially the no-till treatments of the monolith lysimeter experiment (Figure 4A). In the till treatment N2O concentrations averaged 2.7 ± 0.2 ppmv at 1.4 m depth, or 8.5 times greater than concentrations near the soil surface. In the no-till treatment concentrations at the 1.4 m depth were 6.8 ± 0.4 ppmv, 21 times greater than near-surface concentrations. During parts of the year, however, trends were reversed: In the winter and early spring, concentrations were higher in near-surface horizons. On March 8, 2011, for example, N2O concentrations in one of the tilled plot lysimeters peaked at 4.2 ppmv at 7 cm depth and then declined to 2.1 ppmv at 1.4 m depth (Figure S1). Total N2O emissions for the sampling periods calculated from N2O concentration gradients were 2.2 ± 0.3 and 1.1 ± 0.1 kg N2O–N ha−1 in the till treatment in 2010 and 2011, respectively, and were 3.7 ± 0.6 and 4.8 ± 0.7 kg N2O–N ha−1 in the no-till treatment (Figure 5). Treatment differences were significant (p < 0.001). Mean seasonal N2O concentration profiles observed in the experiments. Atmospheric concentration was 0.32 ppmv. A Till and no-till monolith lysimeter treatments; B average of rainfed and irrigated Resource Gradient Experiment treatments; C poplar, alfalfa, early successional community, and the mid-successional mown grassland (never tilled) systems of the Main Cropping System Experiment (MCSE). Comparison of total seasonal N2O emissions measured by static or automatic chamber methods and modeled from N2O concentration and diffusivity at 10 cm depth. A Till and no-till monolith lysimeter treatments; B rainfed and irrigated Resource Gradient Experiment treatments; C poplar, alfalfa, early successional community, and mid-successional mown grassland (never tilled) systems of the MCSE. Total cumulative surface fluxes calculated from N2O diffusion gradients were correlated with surface fluxes estimated from chamber measurements (r = 0.65, p < 0.02) (Figure 5). Diffusion-calculated N2O production differed strongly by depth (Figure 6). Across both years and both tillage treatments (which did not differ significantly), 40–60% of surface N2O emissions appeared to have been produced in the 0–20-cm soil depth layer, and up to 30% in the 20–40-cm and 40–60-cm depth layers; deeper horizons produced no more than 10%. Annual proportional N2O production by depth as calculated from concentrations and modeled diffusivity. A Till versus no-till monolith lysimeter treatments; B rainfed and irrigated Resource Gradient Experiment treatments with different rates of N fertilizer levels (0–246 kg N ha−1); C perennial (poplar, alfalfa, early successional, and mid-successional mown grassland (never tilled)) systems of the MCSE. Highest seasonal concentrations at each depth in fertilized treatments of the Resource Gradient Experiment occurred within 30 days following N fertilization. N2O concentrations usually increased with depth (Figure 4B), with the exception of the 246 kg N ha−1 rainfed treatment on day 173 and the 101 kg N ha−1 irrigated treatment on days 173–186, where N2O concentrations declined with depth. Rainfed treatments had higher mean seasonal N2O concentrations than irrigated treatments for the entire profile and for all N input levels except for the 101 kg N ha−1 treatment, where N2O concentrations reached 300 ppmv on 1 day, and for one-week N2O concentrations were above 40 ppmv. Mean temporal autocorrelation for N2O concentrations in the irrigated treatment is significantly above the mean for the rainfed treatment (p = 0.002, Figure 7). Results show a significantly sharper decline for rainfed treatment correlations than for irrigated (p < 0.01). Average temporal autocorrelations of N2O concentrations at different depths. Autocorrelation values close to one indicate N2O concentrations with low temporal variability, whereas autocorrelations close to or below zero indicate highly variable and unstable values. A Till and no-till monolith lysimeter treatments; B rainfed and irrigated Resource Gradient Experiment treatments. Measured total annual N2O emissions increased with N fertilizer input for both rainfed and irrigated treatments (Figure 5B) as did total annual N2O emissions modeled from concentration gradient and diffusivity estimates. Correlations between measured and modeled emissions averaged r = 0.63 (p = 0.001); they were higher for rainfed (r = 0.83, p = 0.004) than for irrigated treatments r = 0.58 (p = 0.045). The fraction of total N2O produced lower in the profile for rainfed treatments was large and declined with N fertilizer input. Modeled N2O production indicated that irrigated treatments produced 80–95% of total modeled emissions in the top 20 cm of soil, with the exception of the 135 kg N ha−1 fertilizer input level, where N2O emissions from surface horizons were approximately 40% of total modeled emissions. In the MCSE site the alfalfa system had much higher mean annual soil N2O concentrations than the poplar, early successional, and mown grassland systems, which all had very low mean seasonal N2O concentrations below 0.7 ppmv. Correlations between N2O concentrations at two different depths declined with increased distance between the two depths. This decline in correlation with depth was significantly (p < 0.01) sharper for poplar and alfalfa systems than for the successional systems. 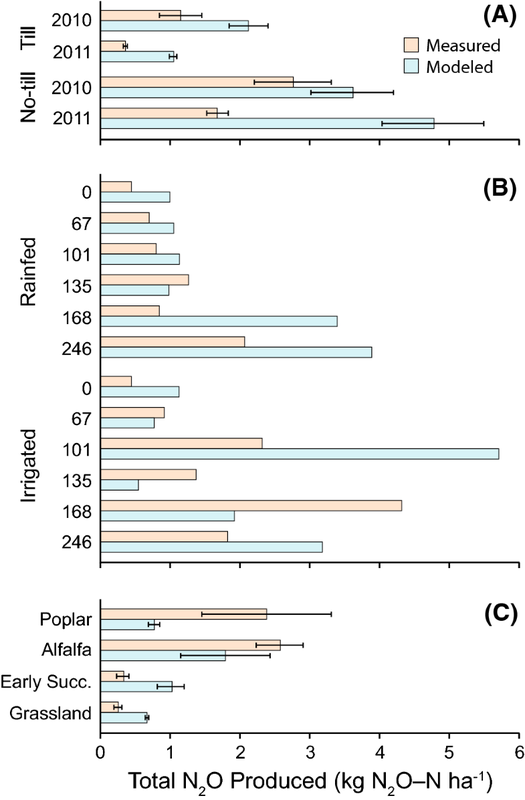 Modeled total N2O surface emissions were higher in alfalfa than in the poplar and successional systems (Figure 5C). 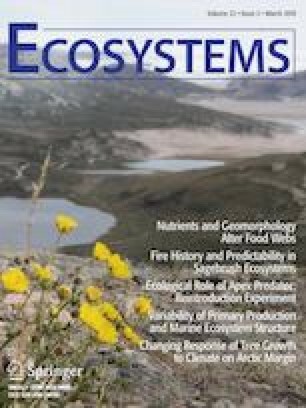 Measured total N2O emissions for alfalfa and poplar systems were higher than for successional communities. The correlation between measured and modeled annual N2O emissions in the alfalfa, poplar, and successional systems is r = 0.74 (p = 0.06). In the alfalfa and successional systems almost 90% of total N2O emissions were produced in the top 20-cm horizon. In the poplar system only 80% was produced in the surface horizon. Temporal autocorrelation of N2O concentrations also increased with depth for all experimental treatments, starting as low as R = 0.1–0.2 for the top depth measured and reaching values as high as R = 0.8 at the deepest horizons (Figure 7). Paired correlations among N2O surface fluxes and N2O concentrations are positive and significant. The correlations are highest for values measured at similar depths and significantly decline for values measured farther apart (Figure 8). 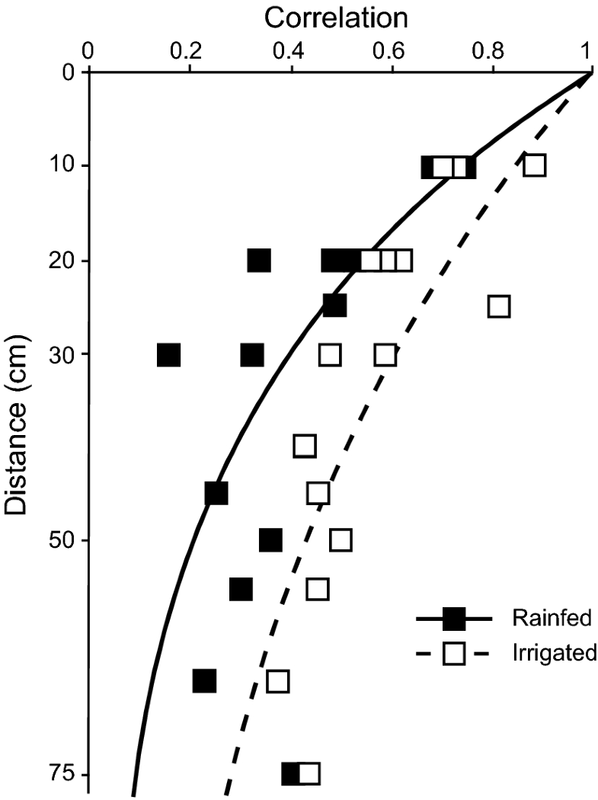 Change in spatial (depth) correlation between N2O surface fluxes and soil N2O concentrations with distance between measurement depths for rainfed and irrigated Resource Gradient Experiment treatments. Each point represents a correlation of N2O concentrations at two different depths in 2011 versus absolute differences between the depths. Autocorrelation values close to one indicate N2O concentrations at two depths changing in the same direction and with the proportional magnitude; values close to zero indicate no dependency between concentrations at the two depths. We observed a steep and consistent increase in N2O concentration with depth for 80–90% of sampling periods on all three sites (Figure 4): the monolith lysimeter experiment, the Resource Gradient Experiment, and the MCSE. Mean seasonal N2O concentrations increased with depth for every treatment in the three experiments, as detailed below, reaching N2O concentrations more than 18 times higher than atmospheric concentrations. Total annual N2O emissions interpolated from chamber measurements and calculated from soil N2O concentration profiles were correlated for the three experiments (Figure 8). N2O production declined with depth in most treatments particularly below 60 cm (Figure 6). Surface soil layers (0–20 cm) produced more than 50% of total annual N2O emissions for most treatments, with a few exceptions in the Resource Gradient Experiment treatments. The exceptions were rainfed treatments with 0–135 kg N ha−1 input and the irrigated treatment with 135 kg N ha−1 input, where the surface soil layer produced 25–40% of the annual N2O emissions. We observed two distinct types of N2O concentration profiles created by the relative rates of N2O production and diffusion processes. The most common profile shape, observed in most experiments on most dates, is a concentration increasing with depth with saturation in deeper horizons. This pattern has also been observed by others (for example, Clough and others 2006; Goldberg and Gebauer 2009) and occurs when diffusion is fast enough to carry N2O produced at depth to sites of consumption elsewhere in the profile or to the atmosphere or groundwater sinks. The other N2O profile shape has the highest concentration near (but not at) the surface, with decreasing or nearly constant concentrations with depth, likely due to relatively slow diffusion of the N2O produced at depth. N2O is effectively locked in near the place of production. This happens in soils under two contrasting sets of conditions: in late spring or summer after N fertilization followed by rain (Figure S1a), and in winter with surface emissions entrapped by water or ice (Figure S1b). Rainfall following fertilization can lead to intensive N2O production at the top of the profile, with the possibility of surface soil N2O concentrations as high as 100- to 1000-fold greater than atmospheric concentrations. 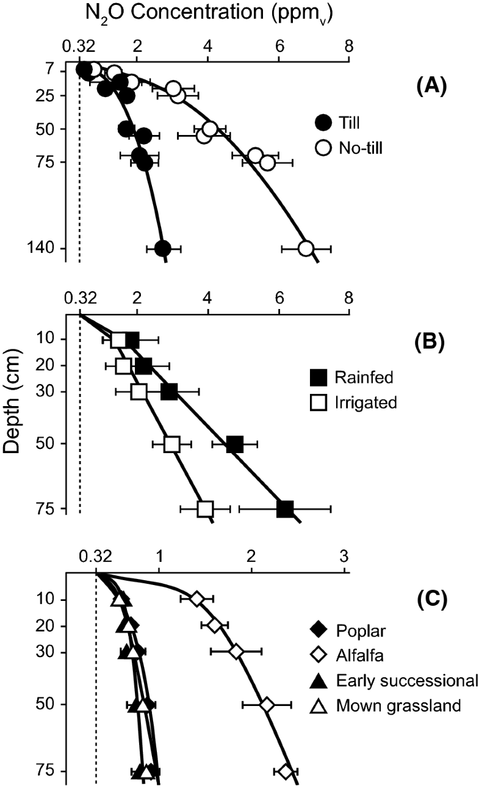 Similar N2O concentration responses to N fertilization have been reported by Wang and others (2013), who found maximum concentrations at their shallowest sampling point (30 cm). Wintertime N2O production can be severely restricted in the surface horizon if it is saturated or blocked by ice (for example, Van Groenigen and others 2005b), such that N2O produced in unfrozen soil below the frost line can build to high concentrations just below the layer of frozen soil. Observed differences in mean annual N2O concentrations between treatments are driven by daily N2O concentration differences in the period of most intensive N2O production, which usually follows N fertilization; at other times, concentrations are relatively low and uniform. This shows how N management at the surface can affect belowground N2O dynamics that lead to changes in N2O fluxes to the atmosphere. The amount of mineral N in the profile influences the average annual N2O concentrations in the profile: Alfalfa with intermediate N2O concentrations likely has intermediate levels of mineral N in the profile, between those of the N-poor successional communities and those of N-fertilized corn. Variability in N2O concentrations reflects the spatial and temporal variability of soil conditions (temperature, moisture, and NO3− and DOC concentrations) that decline with depth (Figure S2), especially below the root zone. Temporal autocorrelation results show that N2O concentration variability declines with depth to values close to one (Figure 7), explained by more constant environmental conditions in deeper horizons. Variability was also affected by irrigation, with less variability in the irrigated treatment of the Resource Gradient Experiment at all depths but the lowest, where variability was equally low in both treatments (Figure 7). This is likely due to a more constant soil moisture content under irrigation. Total annual N2O emissions measured directly and calculated from the N2O concentration gradients and diffusion rates were positively correlated for most treatments (r = 0.58 to 0.83). Previous studies comparing direct N2O emission measurements with calculations by the gas gradient method have had mixed success (Rolston and others 1976; Yoh and others 1997; Maljanen and others 2003). Jury and others (1982) suggested that surface N2O flux measurements may not be quantitatively related to the rate of N2O production in the profile due to the time lag caused by slow diffusivity and potential for N2O consumption in some soils. Total calculated N2O emissions were higher than measured emissions in the monolith lysimeter experiment (Figure 5A) probably due to overestimation of diffusivity of N2O in the surface horizon of the profile. Both methods showed higher total N2O emissions in no-till than in till treatments, possibly because of a wetter surface soil horizon in no-till (Robertson and others 2014), which could lead to greater N2O production. In the Resource Gradient Experiment, measured total annual N2O emissions agreed with calculations by the concentration gradient method and increased with N inputs in both rainfed and irrigated treatments. The MCSE alfalfa treatment had larger measured annual N2O emissions than did the successional communities (p = 0.001), but modeled N2O fluxes did not show significant differences among the treatments (Figure 5C). Our results show that subsurface N2O production is important in a variety of management systems across the KBS landscape. Two major profile factors most influence total N2O production and fractions of N2O produced by depth: NO3− concentration and moisture content. Tillage does not appear to have an influence on the fraction of subsurface N2O produced (Figure 6). Soil profile NO3− concentration is one of the major drivers of total N2O production and the fractions produced in each soil horizon. In the Resource Gradient Experiment, high N fertilizer inputs (168–246 kg N ha−1) that exceeded plant N requirements produced high N2O fluxes from surface horizons due to high inorganic N concentrations. Under conditions of low to moderate rates of N fertilizer input (0–135 kg N ha−1) in the rainfed treatments of the Resource Gradient and in the monolith lysimeter experiments (Figure 6A, B), the fraction of total N2O produced in the subsurface was as high as 40–60%. In contrast to all annual cropping systems, in the perennial systems, whether cropped or unmanaged, only 10–20% of total annual N2O production occurred below the surface Ap horizon (Figure 6C). Water status of the soil profile and especially the surface horizon is another crucial factor in determining total N2O production in the profile and the fractions produced in each horizon. 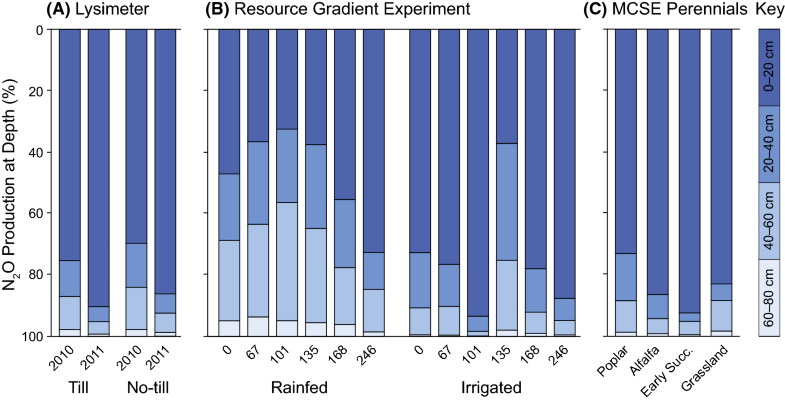 In the irrigated treatments of the Resource Gradient Experiment (Figure 6B) approximately 75% of N2O production was concentrated in the surface horizon (with one exception), which is a much larger fraction than in rainfed treatments with low to moderate N input. Dry surface horizons in rainfed treatments shifted N2O production lower into horizons that were relatively wet. Clough and others (2006) observed a similar N2O production shift in unfertilized forest during summer drought. Tillage, on the other hand, did not change the fraction of N2O produced in subsurface horizons (Figure 6A). Our results show correspondence between total annual N2O fluxes measured directly and modeled from concentration profiles, but there is room for improvement. Much of the difference between the two ways to estimate total N2O flux may be sampling artifact. For example, one source of error is the difference in sampling time between measured and modeled fluxes that in our study was up to 3 h during some sampling events. Another source of error is the large spatial variability of N2O emissions; emissions measured just a couple of meters away may differ considerably. In our study, the samples taken by the two methods were at a distance of up to 5 m apart. Finally, error may also result from variability in moisture content not captured by our moisture model and our choice of gas diffusivity model. There are possible improvements to all of these areas of potential error. An automated system for sampling N2O profile concentrations positioned close to and synchronized with a chamber system for measuring surface fluxes would reduce temporal and spatial discrepancies between the measurement methods. Direct measurements of moisture will bring improvements by eliminating moisture models as a source of error. Results suggest that subsurface sources of N2O are important in annual cropping systems whether rainfed or irrigated, and thus that subsurface conditions should be included when designing practices to minimize greenhouse gas emissions from agricultural soils. Results suggest further that quantitative N2O models should consider subsurface soil layers to improve the simulation of daily and seasonal N2O production, storage, movement, and emission to the atmosphere. The generalizability of these findings to other soils awaits experimentation elsewhere, but we believe the general patterns identified here to be robust. In soils heavier than our loams, for example, higher clay contents will slow diffusion during unsaturated periods such that absolute concentrations of N2O throughout the profile will likely be higher, but the same general patterns should prevail with the exception that surface soil concentrations will be especially high following rainfall after fertilization. Under saturated conditions that occur during mesic winters and rainy seasons, diffusion will be slowed everywhere by water. N2O concentrations increased with depth in our agricultural soils except after fertilization, which causes intense surface soil N2O production, and except in the winter when the profile was saturated and surface emissions were blocked by ice and snow. N2O production in subsurface horizons was especially important in annual crops, with over 50% of total N2O produced in subsurface soils when crops are fertilized at recommended rates. In systems with perennial crops or native vegetation, subsurface N2O production represented less than 20% of total surface emissions. The fraction of total N2O produced in subsurface horizons appeared largely controlled by NO3− availability and the moisture status of the soil profile and was not affected by tillage. Subsurface soils of sites fertilized at levels greater than plant N requirements produced at depth only a fraction of the total N2O emission compared to surface horizons. Dry surface soil horizons in rainfed treatments also shifted relative N2O production into lower horizons where moisture was available. Results confirm with in situ empirical evidence the inferences from earlier studies that subsurface N2O production can be substantial. We thank K. Kahmark, S. VanderWulp, and C. McMinn for help with sampling and laboratory analyses, J. Simmons for agronomic management, and J. Schuette and V. Shcherbak for help with figures. We also thank B. Basso, P.R. Grace, S.K. Hamilton, and A.N. Kravchenko for many helpful discussions and comments on earlier drafts. Funding was provided by the US National Science Foundation Doctoral Dissertation Improvement Grant (DEB 1110683) and Long-Term Ecological Research (DEB 1027253; 1637653) programs, the US Department of Energy, Office of Science, Office of Biological and Environmental Research (DE-SC0018409 and DE-FC02-07ER64494), and Michigan State University AgBioResearch. Crum JR, Collins HP. 1995. KBS soils. Kellogg biological station long-term ecological research special publication. Zenodo. https://doi.org/10.5281/zenodo.2581504. Kahmark K, Millar N, Robertson GP. 2018. Greenhouse gas fluxes—static chamber method. https://lter.kbs.msu.edu/protocols/113. Scervini M. 2009. Thermocouples: the operating principle. Available at https://www.msm.cam.ac.uk/utc/thermocouple/pages/ThermocouplesOperatingPrinciples.html. Shcherbak I, Robertson GP. 2019. Data from: Nitrous oxide (N2O) emissions from subsurface soils of agricultural ecosystems. Dryad Dig Repos. https://doi.org/10.5061/dryad.c6c4bt8.